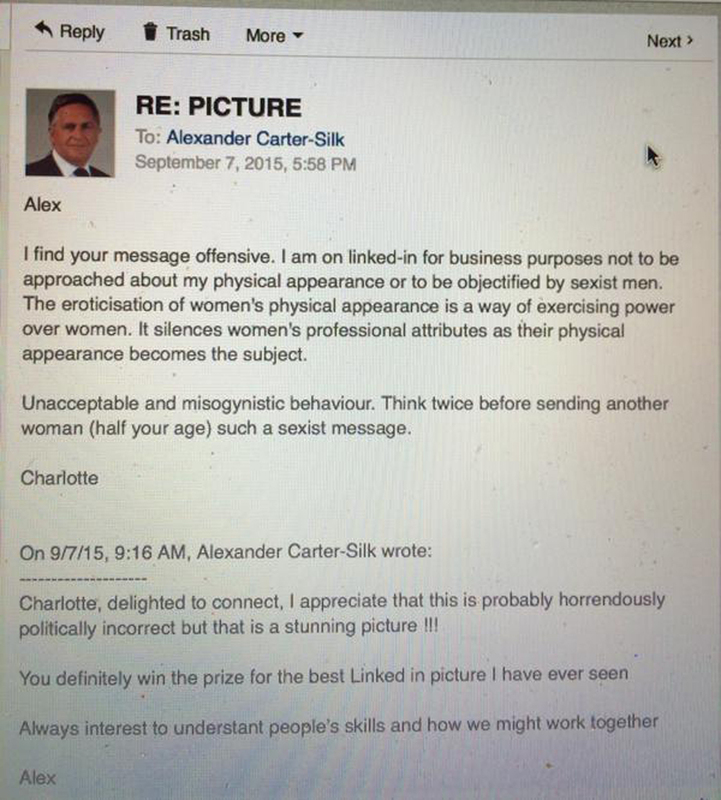 Barrister Calls Out ‘Sexist’ LinkedIn Message But Is It The New Tinder? An up-and-coming barrister has ignited a fierce debate about what constitutes sexism after she called out a senior partner for an inappropriate LinkedIn message. Charlotte Proudman, 27, connected with 57-year-old Alexander Carter-Silk on the networking site presumably in the hope of establishing herself in the competitive world of law, in an attempt to further her burgeoning career. ‘I am on LinkedIn for business purposes not to be approached about my physical appearance or to be objectified by sexist men. Charlotte posted the exchange on Twitter and has since found herself the poster child of the dreaded “feminazi” movement, as splashed across the front page of a national newspaper. While many have supported Charlotte’s bravery for standing up for women everywhere who are subjected to these “harmless” examples of everyday sexism, there are a number of people who would use Ms Proudman as the prime example of “feminism gone too far”. It feels like a shame that we have to point this out in 2015, but there are plenty of ways to spot sexism and, unfortunately for Mr Carter-Silk, this message is full of them. The fact that Carter-Silk even acknowledges in his message that what he’s about to write is “probably horrendously politically incorrect” and then writes it anyway smacks of a sense of entitlement. Although he knows he is about to be inappropriate and make a complete stranger feel uncomfortable, oh well he’s going to press on and do it anyway. LinkedIn is not Facebook. It’s not Twitter. It’s not even Instagram. It is not there for you to have a few glasses of red, look up your school ex and send them a regrettably drunk, suggestive message asking them to meet you behind the old bike sheds “for old time’s sake”. It is definitely not the place to be commenting on people’s looks. However Charlotte isn’t the only one who’s been at the receiving end of inappropriate LinkedIn messages recently. Her case has prompted more women to come forward, saying men had been using LinkedIn “like Tinder”, and forcing them to change their profile pictures to put them off. No, we can’t quite believe it either. Felicity Gerry QC weighed in on Charlotte’s experiences, commenting, ‘We are all getting the hang of how to behave on social media but this man behaved like he was on Tinder. Do you think the message was harmless or sexist? Are all social media outlets destined to become hook up facilitators?